Communist Party supporters stand next to a monument to Karl Marx, left, and hold Soviet flags and portraits of Soviet founder Vladimir Lenin, right, during a demonstration marking the 100th anniversary of the 1917 Bolshevik Revolution in Moscow, Russia, Nov. 7, 2017. Ukraine proudly announced this year that the country was free of all monuments to Bolshevik leader Vladimir Lenin in towns controlled by the Kyiv-based government. But while Ukraine has been busy completing the tearing down of statues to Lenin and monuments to other Communist figures, Soviet heroes have never been more in vogue in neighboring Russia. Monuments to Lenin have been springing up across the country. Other Communist luminaries have received tributes, too, including Communist spymaster Felix Dzerzhinsky, the founder of the KGB, who was dubbed Lenin's "willing executioner." Dzerzhinsky once wrote: "We stand for organized terror -- this should be frankly admitted. Terror is an absolute necessity during times of revolution. Our aim is to fight against the enemies of the Soviet government and of the new order of life." 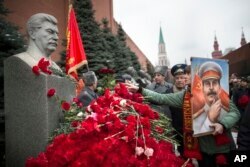 A woman holding a portrait of Josef Stalin places flowers near the monument signifying his grave near the Kremlin wall, marking the anniversary of Stalin's birth, in Moscow's Red Square, Dec. 21, 2017. Soviet nostalgia used to be the preserve of quirky fringe groups composed mainly of resentful old Communist retainers, destitute state pensioners and right-wing nationalists lamenting Russia's military weakness. But it has become more widespread, with even youngsters embracing a glorified past — and Russian leader Vladimir Putin doesn't appear to mind. Since 2014, regret about the collapse of the Soviet Union has been high, with about half of the population remaining nostalgic about the past and lamenting the end of the USSR, according to pollsters at the Leveda Center. A 2017 survey by the polling agency found that 47 percent of Russians approved of Josef Stalin, both for his personality as well as his "managerial skills," despite his bloodthirsty legacy. Historians estimate that Stalin was responsible for more deaths than Adolf Hitler. And nostalgia has fueled the rehabilitation of a host of characters in the Soviet story that few thought would ever again be eulogized — including biologist Trofim Lysenko, who has been dubbed "the Soviet era's deadliest scientist" for his role overseeing Stain's agricultural polices that led to famines fatal to millions. Lysenko believed that modern genetics was a Western imperialist plot designed to undermine Russia. There have been an increasing number of books and articles praising Lysenko, "part of a disturbing pro-Lysenko movement, which is accompanied by a growing sympathy for Stalin," a group of Russian and German scientists noted in a recent article for the journal Current Biology. Despite the triumphs of modern genetics and the discrediting of Lysenkoism, "recent years have seen a rethinking of [his] doctrine in Russia," they said. 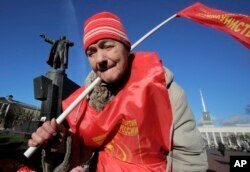 Communist Valentina, 73, attends celebration of the 100th anniversary of the 1917 Bolshevik Revolution near a statue of Soviet Union founder Vladimir Lenin in St. Petersburg, Russia, Nov. 7, 2017. Last November, the Kremlin played down the centennial of the Bolshevik Revolution, although it didn't move to deter Communist devotees from holding celebration rallies. Uneasiness about memories of revolution and uprisings is one thing; celebrating Soviet heroes and strong national leadership is another, say analysts. In the run-up to March presidential elections, Soviet nostalgia and celebrations of Russian nationalism serve a useful purpose for the Kremlin. Putin is assured of winning in March, but there are Kremlin worries about voter apathy and low turnout. Patriotic appeals and eulogies to forceful leadership and national discipline could help in getting more voters to the polling stations. Putin has not been shy to co-opt the Soviet regime's greatest victories and Russian nationalism to burnish himself and his own credentials. Flying into Crimea after annexing the Ukrainian province in 2014, Putin's itinerary was tightly choreographed to invoke the past. He laid a wreath at a World War II memorial, visited an ancient Russian Orthodox cathedral, and recalled czarist and Soviet-era glory with an inspection of Russia's Black Sea Fleet at Sevastopol. 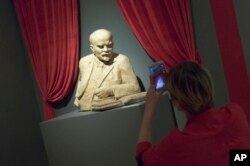 A woman photographs the sculpture of Soviet founder Vladimir Lenin during the opening of "Energy of the Dream. Сentennial of the 1917 Revolution" exhibition in Moscow, Nov. 2, 2017. Not only have Kremlin officials increasingly been encouraging Soviet nostalgia and the memory of Stalin, they also have been promoting autocratic figures from Russia's pre-Communist past — including Ivan the Terrible. Last October, the government endorsed the country's first-ever monument to Ivan the Terrible, with the unveiling in the city of Orel of a statue to the 16th-century czar who expanded Russia but at great human cost. Ivan the Terrible is reputed to have killed one of his sons during a rage. The official lionization of historical despots feeds into an embrace of anti-democratic values, according to academic Dina Khapaeva, professor of Russian at the Georgia Institute of Technology. She noted in an article for Project Syndicate, a nonprofit that distributes commentary, that Russian officials have even spoken approvingly of Russian serfdom, which "complements the desire for a return to autocracy." "No wonder, then, that monuments to Stalin, too, are multiplying in Russian cities," she said.